Let's turn the clock back to 2018. That year, in February, Finance Minister Arun Jaitley announced the ambitious Ayushman Bharat scheme, a healthcare bonanza for 10 crore families, who would be eligible to receive Rs 5 lakh as annual health insurance. Seven months later, in September, Prime Minister Narendra Modi formally launched the health insurance scheme across 450 districts of the country. Though experts are divided over the possible gains to be accrued from the scheme, many concede that, at the very least, the government has managed to make healthcare a part of the mainstream discourse. “Between 2017-2018, health has become a visible part of the development discourse in the country,” says Dr Srinath Reddy, president, Public Health Foundation of India. Since the launch of Ayushman Bharat and the National Health Policy of 2017, discussions over the merits of investment on preventive and primary healthcare versus tertiary care, the realisation of the concept of Universal Health Coverage, the issue of increasing dominance of the private sector and consequently, rising costs and high out-of-pocket expenditure on healthcare, and questions around the role of the state in improving access to affordable and quality healthcare have come to the fore. “The initial years were bad, but lately, the NDA has been able to bring the focus back to health. The prime minister has been consistently talking about health issues in his tenure, has mainstreamed health policy and introduced it in the larger electoral arithmetic,” says Oommen C. Kurian, Public Health Fellow, Observer Research Foundation. 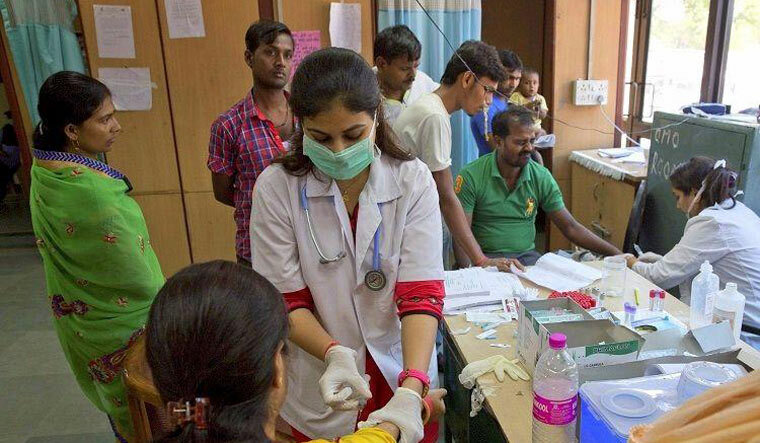 “Though fears of neglect of the National Health Mission are real, there are many significant milestones over last five years, in terms of guidelines, policies and acts," says Kurian. Others stress that unless there's an increase in the health budget, all well-meaning schemes and ambitious goals will remain a pipe-dream. Successive governments have promised to raise the country's health budget [currently 1.15 per cent of GDP], but nothing much has been done on that front. According to the National Health Policy, 2017, this government, too, has promised to increase the health budget to 2.5 per cent of the GDP by 2025 “in a time-bound manner”. Experts say that even BRICS countries such as China, Brazil, South Africa and Russia have a higher health budget than India; the average in low income countries is 2.5 per cent of the GDP, and we are far from that number, too. According to the members of the Jan Swasthya Abhiyan, the Union government has continuously reduced allocations to the Ministry of Health and particularly to National Health Mission (NHM)in every budget. "The NHM’s share in the total allocation on health went down from 61 per cent in 2014–15, to less than half (49 per cent) in the 2019–20 interim budget. These stagnant and declining allocations put us squarely on the track to losing the gains that were achieved through the NHM in its first decade," the JSA said in a statement released after the budget this year. In its report card, besides the ambitious Ayushman Bharat scheme, the government will also count two prominent laws—HIV/AIDS (Prevention and Control) Act, 2017, and the Right to Mental Healthcare Act, 2017—among its successes in the domain of health. However, the biggest miss of the NDA, would be the National Medical Commission Bill, 2017. Despite having the required numbers in the Lok Sabha, the government could not manage to pass the draft legislation, and lost a sure shot chance to reform medical education and regulate medical ethics in the country. The bill, that was introduced in the Parliament in December, 2017, went through several amendments following protests from the influential section of doctors from the Indian Medical Association. Subsequently, a few amendments were made in the draft legislation in 2018, but the bill did not come up for discussion in Parliament.